Price: CDN$ 178.60 FREE SHIPPING. 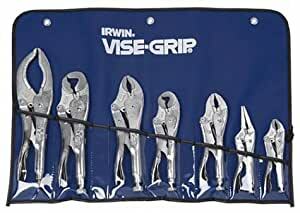 The IRWIN VISE-GRIP Original 7-Piece Locking Pliers Set features high-grade, heat-treated alloy steel construction for maximum toughness and durability. Each piece of the IRWIN pliers set has hardened teeth that are designed to grip from any angle and a classic trigger release designed to provide maximum locking force. The set includes 10CR, 6LN, 7R, 10LW, 7LW, 5CR and 12LC locking pliers to suit a wide assortment of needs. Also comes with a kit bag as an added bonus. Advertised fraudulently as "Made in USA", but in fact "Made in China"
These used to be great. Side by side with my USA made Vise Grips the drop in quality is obvious. Some may say that the quality is the same, but the fit and finish is not even close and under moderate use the imports fall apart. To add insult to injury the price hasn't dropped any.